Another great festival season starts on Syros! 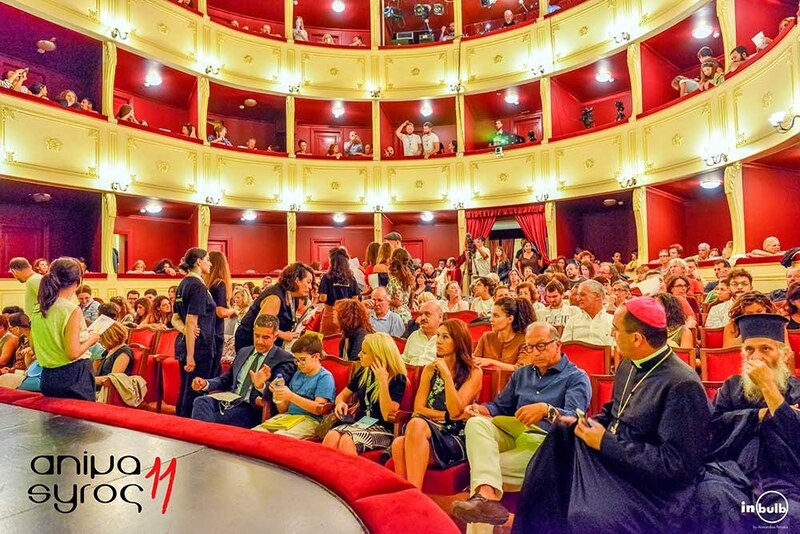 Curated by the Syros - Ermoupolis Municipality, SYROS CULTURE 2018 brings unique, high-quality experiences to the heart of the Cyclades from May to October - concerts by prominent music artists, theatrical performances, art exhibitions, and children's events. Hosted in the island’s medieval settlement, Ano Syros - the birthplace of Rebetiko legend Markos Vamvakaris - as well as at the Apollon Theatre - one of the oldest theatre houses in Greece, a landmark neoclassical building in the country’s first commercial hub, the port of Ermoupolis - and in the island’s picturesque villages, with their spectacular architecture, SYROS CULTURE 2018 offers an array of not-to-be-missed cultural experiences on this beautiful island. Ermoupolis Choral Festival is a wonderful initiative of the Syros Music Club, a well-established cultural association of Syros; choral ensembles from all over Greece and the world come to Syros for concerts. A festival full of passion thanks to the heart and soul of the organiser, Christina Sarioglou. Now in its fourth edition, Tango Festival goes international, featuring acclaimed performers from Argentina and Europe, and aiming to attract ever larger Greek and international audiences. The festival also features seminars for all levels, milonga evenings, and riveting performances. A festival that brings together the unique architectural heritage of Syros and contemporary video art and installations. Filia Milidaki and her team have created a festival of world-class originality. 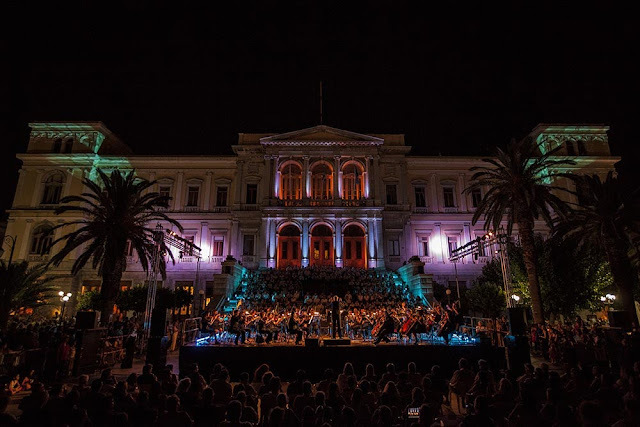 International artists produce video art and installations in the extraordinary neoclassical buildings of Ermoupolis in the only festival of its kind in Greece. Video art, installations, and performances meet against the backdrop of the city's unique architecture. Celebrating the European Year of Cultural Heritage 2018, this year's edition highlights the European cultural identity of Syros, exploring it in the context of other Mediterranean countries, such as Malta and Italy. 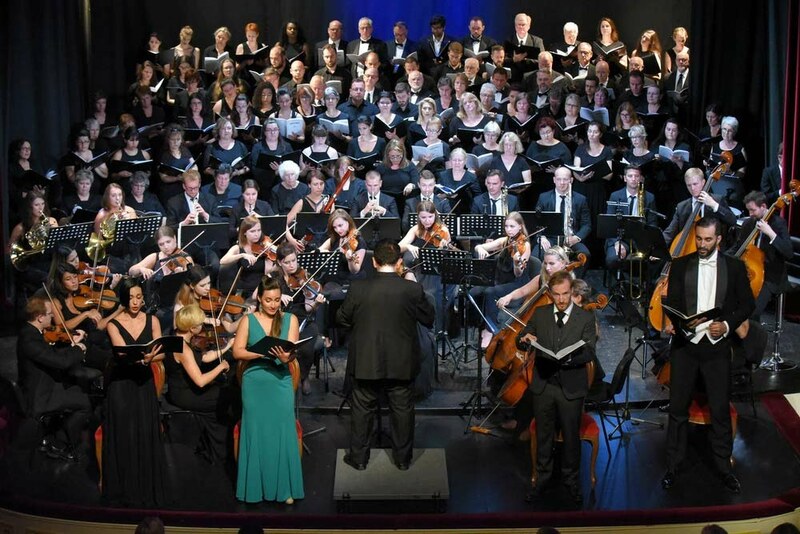 Organised by the Catholic Diocese of Syros and the Association of Catholics of Greek Nationality in Syros, ΑΝΩ International Organ Festival offers high-quality music performances, exploring the unique possibilities of the organ in Saint George's Cathedral, Ano Syros – the oldest organ in operation in Greece (built in 1888 by the celebrated organ builder Zeno Fedeli). Set in a stunning location, towering over the island, with unobstructed views of the Aegean Sea, the festival is a major attraction in the medieval settlement of Ano Syros. Firmly established in the cultural life of Syros, Rebetiko Music Festival was launched in 2016 by the Municipality of Syros –Ermoupolis in collaboration with the Society for the Development and Progress of the Cyclades, Chamber of Commerce. Urban folk music has flourished on Syros as an integral element of culture since the early 20th century. The songs of the great singer and songwriter Markos Vamvakaris have made Rebetiko music and Syros known all over the world, inspiring the establishment of this festival. This year’s edition features an extensive range of events – concerts, theatrical performances, lectures, exhibitions, seminars, as well as children's events, highlighting the contribution of Markos Vamvakaris and his native island, Syros, to Greek and world music. Stray Art Festival explores the different forms of urban art in all their diversity. Popular street and graffiti artists, alongside music and theatre performers, celebrate street culture. The festival is augmented by side events featuring music, dance, theatre, and sports. It was conceived by the students of the Department of Product and Systems Design Engineering, University of the Aegean, and has been enthusiastically embraced by the Syros community. Animasyros has grown into one of the world’s 20 most important animation festivals. 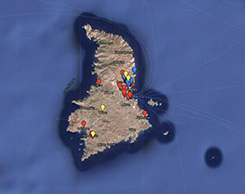 Founded by Vassilis Karamitsanis, the festival features competition sections, special screenings at Poseidonia and in the medieval settlement of Ano Syros, film presentations, special tributes, secret screenings, major international guests, workshops for people with disabilities and the Agora – an annual market for leading animation professionals at Ermoupolis. Welcoming hundreds of animated characters and even more animation fans from around the world, the festival is organised in collaboration with major partners, including the Onassis Cultural Centre and the Greek National Opera. 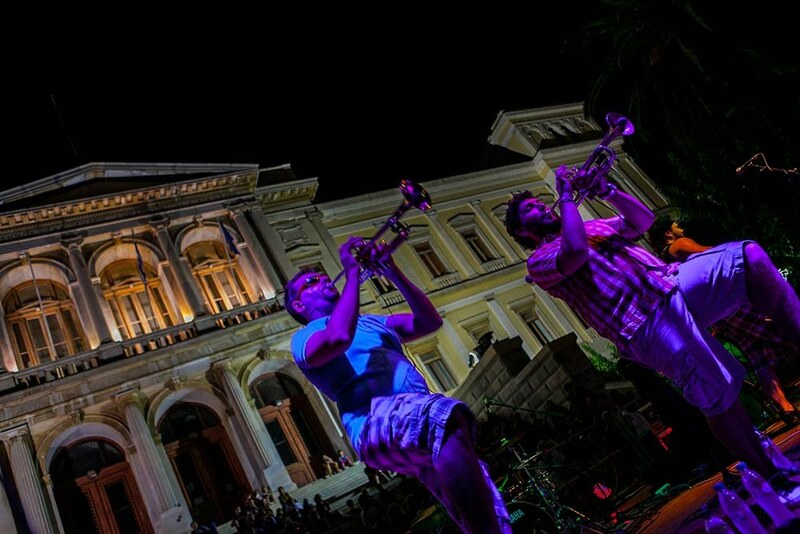 Syros Jazz Festival is the fruit of Vangelis Aragiannis and Yannis Roussos’s love for Jazz music. The festival began in 2013, and its organisers had already produced a number of important live music concerts. One of the festival’s highlights was the presence in 2010 of two great American artists, singer Miles Griffith and drummer Clarence Penn. Every year, the festival hosts important acts from Greece and other countries. In addition to concerts, it features improvisation seminars and Jazz film screenings at Apollon Theatre, as well as high-quality side events. The festival's events in October mark the conclusion of SYROS CULTURE 2018 organised by the Municipality of Syros – Ermoupolis, which is an integral part of cultural life on the island.